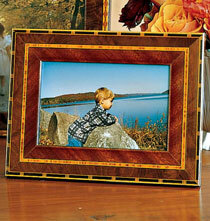 Our marvelous Diamante Italian marquetry frames are available in four photo frame sizes. The play of light and dark woods combined with intricate inlaid patterns make these frames extra rich - and great as a group. They'll look great in a family room or office. As a rule, I do not like frames that are so decorative that they distract the eye from the photo. I bought "diamente" and "Rosa" as gifts, and while the borders are decorative, they are also tasteful and will add to the enjoyment of the photo rather than detract from it. Design works well with many period decors as well as eclectic. These are beautifully made frames. This one will add to my group. I have ordered Marquetry frames in the past and they have been beautiful- they work well in groupings with other wooden frames. I have purchased a number of these frames over many years from Exposures for family photographs . They are lovely frames and I like the matching element. We order picture frames from Exposures year after year because of their selection of unique frames and the quality of the workmanship. 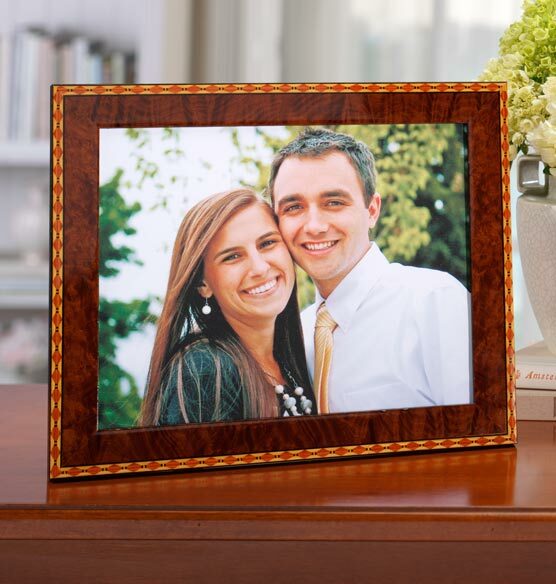 The Diamante Marquetry frame is one of our favorites. I've ordered several of these frames from Exposures over the years. They are lovely & well priced. Wonderful quality for gifts...always get these for wedding presents! Peoople always have photos but are reluctant to buy nice frames for themselves! I have other sizes of this frame already. They're lovely! Lovely wood tones; marquetry design isn't too busy so it doesn't distract from the photo in the frame. The Italian Marquetry frames are my favorites. I favor artiThe Italian Marquetry frames are my favorites. I favor artisans who hand produce objects.sans who hand produce objects. It is attractive and has a good price. I already own these frames and just love them. Looks like it is high quality and it works with the photo I want to frame. Beautiful piece. Hand made quality. I have a few of these frames and I like them. The website only allows the selection of the 3.5 x 5 size yet the description says there are 4 sizes including on that holds an 8 x 10 photo. How do I select the larger sizes?